On the morning of January 20, 2018, Kingsport Police Patrol Officers were called to Main Street Pizza, located at 242 East Main Street in Downtown Kingsport, to investigate a burglary to the business. 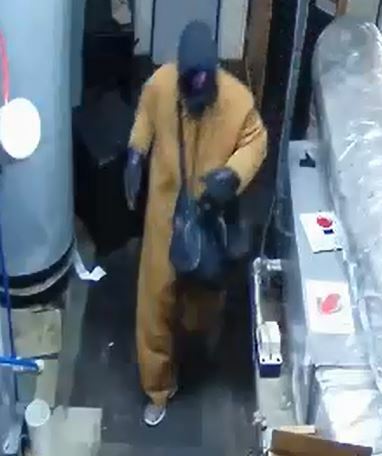 Their subsequent investigation uncovered video surveillance footage of a lone suspect dressed in tan coveralls and black gloves, mask, and hood. The unidentified suspect could be seen entering the business earlier that same morning at approximately 6:30 AM. The suspect then forced open an office door, ransacked the office, pried open a safe, stole an undisclosed amount of cash, and left out the back door. Anyone who recognizes this individual, or who may have any additional information which may help Detectives solves this case, is asked to contact the K.P.D. Criminal Investigations Division at 423-229-9429 or call Kingsport Central Dispatch at 423-246-9111.